Several recent events relevant to Lynden Energy Corp. have occurred over the past year including nearby land sales and bullish analyses. We have listed them below. Averages, $43,870/net acre and $167,144/flowing barrel. 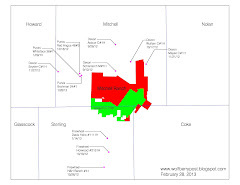 LVL has 5,883 net acres in Glasscock, Howard, Martin and Midland Counties.